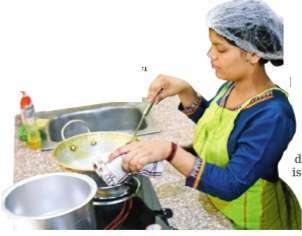 She came to Delhi as a young wife, and the responsibility of bringing up her children pushed her into joining the unorganised workforce of domestic helps. The challenge lay in her name -Maryam. House after house turned her down, she said, because her name identified her as a Muslim. Finally , on the advice of some kindly neighbours, she assumed the name of Bimla. Sure enough, she got hired. “Aaj main jin chaar ghar mein kaam karti hoon woh merey kaam key liye mujhey jaantey hain (The four families I work for now know me for my honest labour),“ she says.Maryam hails from Masaurha village of Purba Champaran in Bihar. 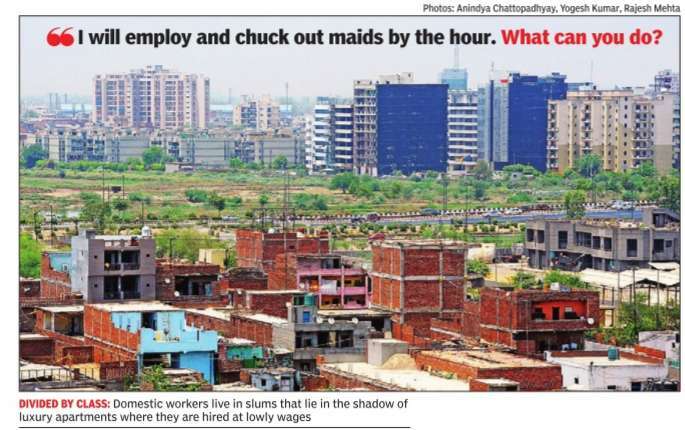 Hundreds of domestic workers like her leave their slum shacks every day to work in the capital’s colonies. But their lowwage jobs leave them prone to accusations of theft, physical abuse and a continuous probing of their caste and religious identities.Outside Maryam’s shack, other women congregate under a tree, eager to air their concerns. One of them says that when a prospective employer learnt she was from Azamgarh, she was skeptical due to the notoriety associated with her hometown. “What does my town have to do with my work?“ the maid wondered aloud. eing finalised and will likely reach the Delhi cabinet ina couple of months. stic workers and violation of their rights to decent wages is clearly due to the absence of laws to protect them. Having been in the committee set up by Delhi government in 2015, he was dismayed by the delay in enacting the sorely needed legislation.“I am disappointed at the lack of decisive action to protect the rights and secure the domestic workers, most of whom are women,“ Kumar said. workers caught the public attention, but faded away. The latest labour department draft estimates the number of people working as domestic helps at 2-2.5% of the population on. Last week, the union ministry of labour consulted stakeholders on the draft law with the ultimate aim being to “formalise domestic work and bring it at par with the formal workforce“.The draft policy says that “the central and state governments shall … institutionalise a social protection floor and ensure domestic workers are able to exercise their labour rights as guaranteed under the Constitution of India“. In Delhi, the committee set up by the AAP government, headed by Shalimar Bagh MLA and then deputy Speaker Bandana Kumari with representatives from voluntary organisations, trade unions and the International Labour Organization as members, first sat on July 17, 2015. The records of the proceedings show that all members agreed that the working conditions of domestic workers were pathetic because of a lack of a specific law to regulate their services.